Member Peter Marson is helping the widow of a late collector dispose of his collection of postcards, photos + cigarette cards and other items. The collection consists of flying boats (250) Boeing Stratocruiser/C-97 photos, Pan American from prop to jets (230) + sundry other cards and photos. Approx 300 postcards. Please send SAE/IRC for priced listings to Peter Marson, 12 Palace Green, Croydon CR0 9AG UK. Alternatively offers from £85 for all 300 postcards. If anyone fancies adding to the cards-out-there by having some published. Member Stanislav Vacek of Prague can arrange printing at prices from approx 9p per card for 450 falling to 6p for 1000 9 (all + shipping). Contact as per members list. Among the more predictable high yielding cards, three stand out as less usual subjects. 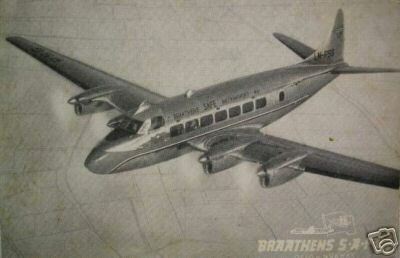 Two UK collectors drove a large size B&W card of a BEA Herald at Sumburgh to near £40. 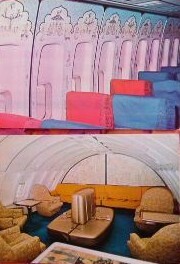 A rare set of Air India 747 cabin crew/interior cards went for yet more, £67 , even though a close up interior view of 747 windows would normally be a “most boring postcard” candidate. Anglo-Norwegian interest competed for a Braathens issue DH Heron (£38). Singapore is a strong outpost of card collectors both of aviation and local history and these came together on some cards of the first flights in the then colony as shown in the Pioneer Pages feature. While rarer Concorde cards continue in demand there is some evidence that the Airbus A.380 is attaining early cult status. The latest airline to feature an advance card is Lufthansa. Hopefully there will not be a parallel between the commercial success of this latest Toulouse product and its predecessor. Meanwhile the first airline issue Boeing 787 card has appeared from All Nippon in Japan.